It’s a late evening and our blogging is a little behind today. Schools were cancelled as the snow fell down and roads froze over. Probably not a big day for restaurant owners in Bethesda hoping for a good turnout for Restaurant Week. Now the lights are flickering this evening as the snow continues to fall and branches laden with heavy wet flakes are falling down and hitting the power lines. 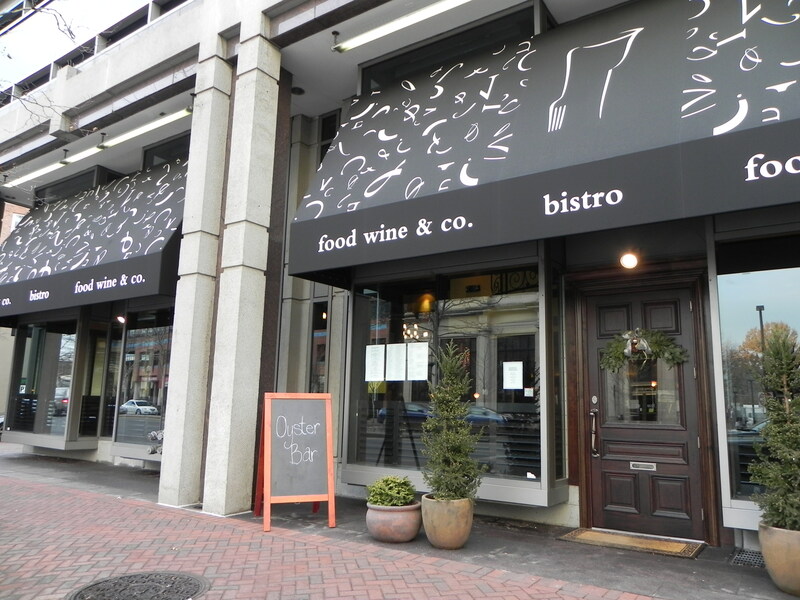 If we were to have ventured out to enjoy a nice dinner on this third day of Bethesda restaurant week, we would have stopped by Food, Wine and Co. located at 7272 Wisconsin Ave. Surprisingly, I learned through this blog that Food, Wine and Co is owned by Francis Namin who also owns Cork 57! We shared Cork 57 in our blog last week. Turns out he is quite the entrepreneur! Last fall, Pizzeria Uno (no great loss to our town) closed its doors and Mr. Namin swooped in with his concept for a sophisticated yet casual dining experience and created Food, Wine & Co. After a renovation that totalled over $1 million, he unveiled his concept and the restaurant has been a huge hit with locals and visitors alike. Food, Wine & Co is a newbie in our Bethesda restaurant scene but it has already become something to talk about. It offers a bit of both worlds – a hip, high energy bar as well as a casual, relaxed dining experience. It is a bistro becoming known for its handcrafted thin crust pizzas, oyster bar, mussels, sandwiches, salads and of course its wine and beer selections! Having met Mr. Namin last week, I get it! He truly appreciates the fruits of the Earth as expressed through wonderful wines and beers and offers an eclectic yet popular selection of interesting selections at his restaurant. You should also check out the charcuterie and cheeses at Food, Wine & Co., but my favorite is definitely the crabmeat dip! Lots of places serve crab dip – but this is crab MEAT dip – chock full of chunks of crab. YUMMY! This entry was posted on Wednesday, January 26th, 2011 at 9:31 pm and is filed under Food and Drink, Restaurants. You can follow any responses to this entry through the RSS 2.0 feed. You can leave a response, or trackback from your own site.